Welcome to The Gadget Professor Show #382 hosted by Don Baine. LBell Projection Alarm Clock, 6.3″ Projection Clock, FM Radio Alarm Clock, Dual Alarm with USB Charging Port, 12/24 Hours, Backup Battery for Clock Setting. ⏰FM Radio with Timer : The alarm clock radio can store up to15 stations from 76-108HMz. It will scan more stations while the signal is better and less on the contrary. You can choose the FM radio as your wake up sound in the morning, and 37in extendable antenna can be used to strengthen the signal and listen to the radio clearly. Moreover, the radio designed with a timer(10,20,30,40,50,60,70,80,90 or off), the radio will automatically turn off after the set time. ⏰Battery Backup & USB Charging: 5V/1A USB output interface can used to charge your phones or other devices at the back of the alarm clock. And the backup battery(included) is only for memory the time and your alarm setting in case of the power failure, not for any other function. The clock need to connect to the power( AC adapter, power bank or the computer) for all functions working. ⏰Adjustable brightness LED Screen with Humidity and Temperature 3 level screen display brightness (low light-bright light-off) allows you to set at ease. 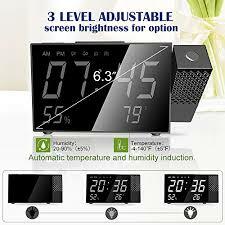 Automatic temperature and humidity induction will activate and display on the screen, there is a ±5 deviation, and you can choose ℃ or ℉ as you like.